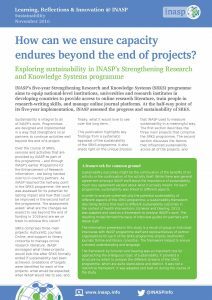 INASP has recently evaluated the long-term sustainability of projects under the Strengthening Research and Knowledge Systems programme. Monitoring and Evaluation Officer Fran Deans shares some of the findings. Midway through our five-year programme – Strengthening Research and Knowledge Systems – we decided to take stock and think about what we can say about the future sustainability of our work. The SRKS programme aims to achieve several outcomes related to making international research more accessible in developing countries, and research from developing countries more visible internationally. 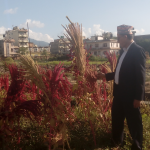 Underpinning all of these pieces of work is the aim that, by the end of the programme, local organizations are able to manage services directly. In several cases this involves handing over a service which INASP has managed to a local partner. So, we took a step back and asked ourselves: How can we confidently claim that what we are doing, and the way that we are doing it – in partnership with local organizations – is going to lead to sustainable outcomes? And, come to that, what do we actually mean by sustainable outcomes? This was the beginning of lengthy, explorative discussions with programme colleagues and partners, steered by INASP’s Monitoring and Evaluation team, to understand what the shared vision of sustainability was and how we could begin to say that we are going to achieve it. Organizational fit: there needs to be a good fit between the activity of interest, and the partner organization’s vision and mission and its existing or planned activities. 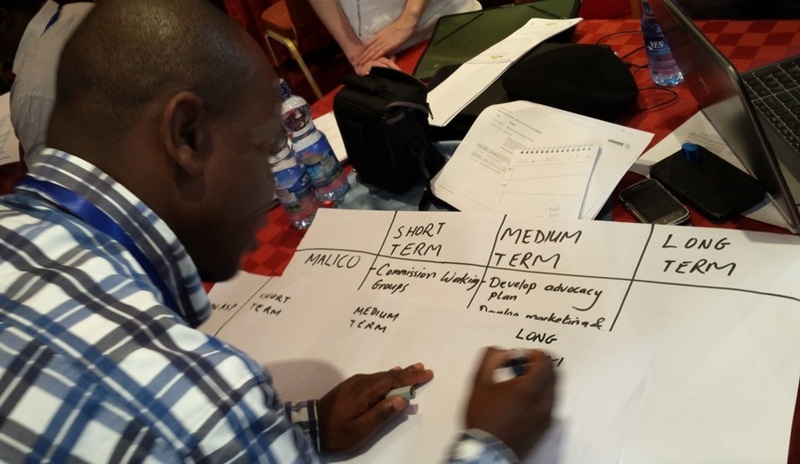 Size of partner institution: within larger institutions it can be harder to get buy-in and ownership from senior management, but these institutions can usually absorb activities more easily, and their business model does not solely depend on INASP support. Champions: there need to be advocates for the projects and services within partner institutions. In the mid- and long-term, a broader support base in the organization for the activity is needed. Demand for services: an institution’s customers or users need to demonstrate a desire for a service and to acknowledge its benefits. The first of the two key lessons that we learned during this piece of research is that sustainability is a dynamic process. The greatest learning was not from the actual outcomes of the study, but from the experience of applying the framework and discussing it with staff and partners. An unexpected outcome of the study was that our participatory approach allowed for adaptive programming – colleagues reflected on the findings of the study and adapted what they were doing as a result. In some cases the findings of the study confirmed thoughts that programme colleagues had already been mulling over, but provided the evidence and structure for changes to be made. The second key learning from this process (as concluded in the report) was that reaching agreement on definitions is not crucial to carrying out such a study. While my colleague and I may have started out on this process assuming that joint agreement was critical, it came to light that improving a programme is not dependent on programme staff having a shared definition of sustainability. As the report illustrates, each programme strand has its own definitions of sustainability, and this works too. My colleague and I found the framework enormously useful to shape our thoughts and questions: it allowed us, as the Monitoring and Evaluation team, to structure our process and the conversations that we had with colleagues, partners and between ourselves when discussing the ambiguous topic of sustainability. What does sustainability mean for you: Is a shared understanding of key concepts important? Can you use such a framework to draw conclusions of the sustainability of your work: Which factors would you consider important for the sustainability of your work? And is there room to adapt your work if required: Are there steps or actions that you need to take to achieve sustainable outcomes?